I can’t tell you how excited I am today! I just received a package of goodies from NuNaturals. You see, after I raved about their stevia, the company contacted me and said they’d like to mail me some of their best products. So now I have lots of new items to try, including their alcohol-free liquid stevia, their fiber + stevia baking blend that measures one-to-one with sugar, their throat spray, the vanilla stevia and the no carbs packets pictured here, their pure stevia powder, and more! Over the next few weeks, I’ll test the products one by one and review them here. I promise to be honest. Don’t worry, they’re not paying me for this. Then — and this is the best part — I’ll share some of them with you, dear readers. So stay tuned! In the meantime, forgive me for my light blogging this week. Exams and all that. Hurricane Ike has made everything quite complicated and high-pressure. But at least I have a roof over my head, even if we do have to replace it. Thank you, God! I know. I eat a lot of ice cream. I won’t deny it. My former roommates could tell you stories about the ice cream they would buy and put in the freezer. I would eat the ice cream, then go out and buy a replacement. But they would leave it in there so long that I finally ate the replacement too, then had to buy another replacement. Sigh. I am not a person that can leave ice cream in the freezer, untouched, for weeks on end. Fortunately, my ice cream habits are far more moderate these days. I eat it once a week, and lately, I’ve tried to eat only homemade ice cream (unless I’m a guest in someone’s home). This allows me to avoid yucky ingredients like high fructose corn syrup and artificial flavorings and colors. Even better, it means I can bypass pasteurized dairy in favor of coconut milk or raw milk and cream. And now, because of the new stevia I ordered, I can make sugar-free ice cream at home that tastes outrageously good. In fact, one could almost consider this kind of ice cream health food, right? It’s made of whole, raw dairy or coconut milk (both sources of important, healthy fats that are great for fertility), stevia (no effect on blood sugar and, as the extract of a sweet herb, no negative impact on the body), and natural flavorings like vanilla and fruit. Hmmm. Health food, indeed! Still, since I want to keep my waist line, I’m sticking with once a week for now. I don’t want to get carried away. The ice cream pictured above, however, is almost enough to make me temporarily forget about my waist and fitting into my jeans. 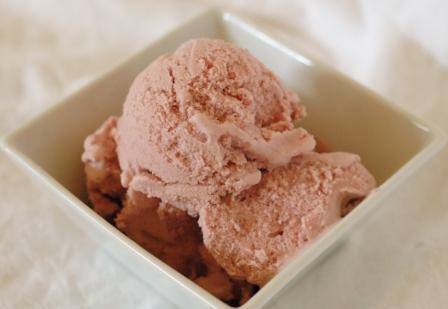 Cheesecake ice cream is a beautiful–and dangerous–thing. I’ve made it three times now, but last night’s batch was special because I used my new stevia. I wrung my hands nervously while it churned because I wanted so badly for it to be good. Lo and behold, it was still fabulous! As I mentioned in the notes to the last stevia-sweetened ice cream, it didn’t have the caramelly depth you get with an unrefined sugar like Sucanat or Rapadura, but it was still wonderful. It’s probably more like using plain white sugar, though I haven’t done that in so long, I don’t really remember. In any case, if you don’t tell the people to whom you’re serving this ice cream that it doesn’t have any sugar in it, they’ll never guess. A few notes: First, really do try to find raw milk for this recipe. Go here for more information on why raw milk is so much healthier than pasteurized milk and for help finding a raw milk source in your area. If you live in the Houston metro area, email me (alison [at] wholesomegoodness [dot] net), and I’ll tell you what I know. Second, use an organic, cultured cream cheese if possible. Cream cheese was originally a cultured product, but most companies these days make it without the healthful probiotics. Organic Valley makes a wonderful organic, cultured cream cheese that I have been buying at my local grocery store. If your market is not well stocked with healthy items, you may need to check out a health food store to find it. Finally, never use Now, SweetLeaf, or a store’s generic brand stevia for this recipe. Because it is sweetened 100% with stevia, only the best-tasting stuff will do. I have tried several brands, and the only one I will use now is NuNaturals NuStevia (some health food stores carry it, but I order it online; shipping is free on orders over $35). 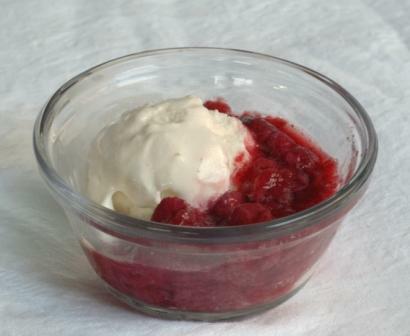 I served the cheesecake ice cream with a strawberry sauce, but I’ll wait to share that recipe as it still needs tweaking. In a blender, mix all ingredients until smooth. Follow your ice cream maker’s churning instructions. Although you can eat this immediately after churning, I prefer to leave it in the freezer for 1.5 to 2 hours before serving. If left longer than that, you may need to let it thaw on the counter for 10 to 15 minutes before scooping. Last Thursday, HMK asked for a completely dairy-free, sugar-free basic ice cream recipe that really works. I got busy over the weekend and came up with this amazing solution. I adored this ice cream. My husband used the words “crisp,” “vivacious,” and “sweet” when I asked him for his thoughts. For my part, I found it light and refreshing–like sherbert. I’m still in shock that ice cream with zero sugar can taste this good! It’s a dream come true for this hypoglycemic, and it’s a perfect solution for diabetics and candida-sufferers too. This recipe is yet another variation on The Nourishing Gourmet‘s original Chocolate Coconut Milk Ice Cream. I have experimented before with the recipe, trying to reduce the sugar content by using part agave nectar and part stevia, but going 100% stevia has never worked. That stevia aftertaste eventually becomes too overpowering. The difference this time around is the brand of stevia. I have tried several before, but nothing comes close to NuNaturals NuStevia. Recommended by Kat James in The Truth about Beauty and by a friend, this stuff rocks! I admit that it does not lend the same mellow, round sweetness to the ice cream that an unprocessed sugar like Rapadura or Sucanat would, but it does produce a light, sherbert-like sweetness without the dreaded stevia aftertaste. Please, please, please do not attempt to make this recipe without some fabulous stevia on hand. Neither Now nor Sweet Leaf brand stevia will do the trick, and definitely don’t go for a store’s generic version. I have never tried Body Ecology’s stevia, which is supposed to be better than most, but a friend who has tried them both find NuNaturals NuStevia superior. 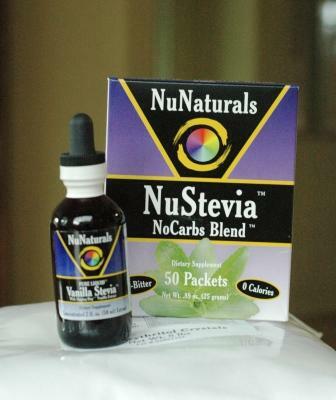 NuNaturals offers a number of stevia products, including liquid extract in glass or plastic bottles, pure powdered stevia, powdered stevia in maltodextrin (to help with measuring), powdered stevia in erythritol (again, for measuring ease), and individual serving packets of stevia. You may be able to find a limited selection of NuNaturals products in your local health food store, but ordering from them online may prove easier, in addition to giving you access to their other products, like xylitol, erythritol, and herbal formulas (the site is a diabetic or hypoglycemic’s paradise). They even offer free shipping on order of $35 or more. I used the NuStevia NoCarbs Blend packets for this recipe. I cannot promise the same results with other forms of stevia, though you are more than welcome to experiment. I’ll certainly be doing that myself. Let me know what you try and how it turns out in the comments. I’d love feedback on this one! Add three packets of stevia, blend, and taste. If you would like additional sweetness, toss in the fourth packet and mix. Pour the batter into your ice cream maker and follow the appliance’s freezing instructions. Like most homemade ice creams, this one has the consistency of soft serve when finished and gets very hard after spending time in the freezer. In the latter case, leave it out on the counter for ten or fifteen minutes to soften before serving.